HDMI 1.3 Rev supports EDID, DDC2B, so the device with HDMI has the feature of "plug and play". Between the source and display devices will automatically "consultation" and select the most appropriate video / audio formats. Compared with DVI, the volumn of HDMI interface is much smaller. 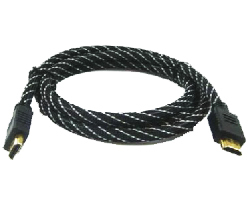 The optimum distance of the length of HDMI / DVI cable is not more than 8 m. As long as owning an HDMI cable, you can replace up to 13 analog transmission lines. This can effectively solve the problem of the tangled mess connections behind a home entertainment system.